Spanning the last decade, our research into Zappa, in collaboration with The Hague's Baroque Orchestra, The New Dutch Academy (NDA), has resulted in the rediscovery and world première presentation of his symphonic music on disc2, in the creation of new modern performance editions of his orchestral works3, and in major new biographical discoveries. This new research into Zappa seemed appropriate, not only because of the quality of his music, but also due to the important role he played in Dutch music history, as both a cellist and composer. This article presents these new discoveries - such as his birth and death dates - and provides a considerably more complete picture of Zappa's life than was previously available 4. Francesco Zappa was one of the many interesting composer/performers working in 18th century Holland. He was an internationally acclaimed cellist and a successful, widely published composer. His oeuvre includes vocal, chamber and symphonic music. His works feature florid, virtuosic instrumental writing, for example the solo cello parts in the 'Cello Symphony'5. He displays, particularly in his symphonic writing, a highly personal and cosmopolitan musical voice, a style which is earthy yet elegant. Zappa was of importance to the musical life of the Netherlands, and made substantial contributions to the quality, vibrancy and international outlook of The Hague's 18th century music scene as a performer, composer, concert organiser and teacher. Francesco Zappa was born in 17176, most probably in the region of Milan. He was working as a music master in Milan, where the Duke of York, who took up residence there between November 1763 and mid-1764, was one of his students7. As was common practice amongst leading musicians in the 18th century, Zappa set about travelling through Europe to seek out and create performing opportunities, to find patrons and supporters, develop fame and reputation, and to get his compositions published. Zappa embarked on a life-changing tour of Europe in the summer of 1764, together with his Milanese colleague and friend, the Franciscan Priest Francesco Pasquale Ricci (1732 – 1817) who was the chapel master and organist of Como Cathedral. Zappa and Ricci first travelled to Germany, visiting Dresden, Frankfurt and Mainz, then going on to Mannheim - the birthplace of the symphony and the location of Europe´s most legendary court orchestra. They proceeded to the Netherlands (with a concert tour around the country in September 1764), and went on to Cologne and Liège (Luik)8. They performed again in the Netherlands, including in Amsterdam on 31 October and on 14 November 1764. On 14 March 1765 they again gave concerts in Amsterdam9, and on 20 November 1765 in The Hague10. It seems that by this time both gentlemen had developed a certain reputation in the Netherlands and had gained insight into the workings of the music scene and its possibilities, particularly for self-organised private concerts, especially in The Hague. During the mid 18th century, stadholder Willem IV and his wife Anna van Hannover (referred to by the English as 'Anne of Orange'), daughter of King George II of England and favourite student of Handel, took up permanent residence in the city of The Hague. During the reign of William IV and particularly his son William V (covering the period 1747 to 1795) the musical life of the court flourished. Like her mother in law, the wife of William V, Princess Wilhelmina of Prussia, the niece of Frederick the Great, was actively interested in music and music making. The Hague's public music and theatre life also received a substantial and strong stimulus from the court. The House of Orange actively supported the city's public theatre scene, which included the Comédie française or 'Franse Comedie' (French Comedy / Opera) which it helped support by making a yearly contribution and by taking out a set of subscriptions. Moreover they used this public theatre as their court theatre, which was quite unlike the position of theatres at other European courts. The Court of Orange's policy to support the public arts of the city alongside the court's own cultural activities (William V in fact instigated the first Dutch open-to-the-public art gallery in The Hague) made The Hague an especially interesting location for international composer/performers such as Zappa. The cultural mindset and pro-active approach of the stadholder's family also found substantial resonance with The Hague's 'monde' – a relatively large group of diplomats, high-end government officials, members of the aristocracy, and cultivated citizens. 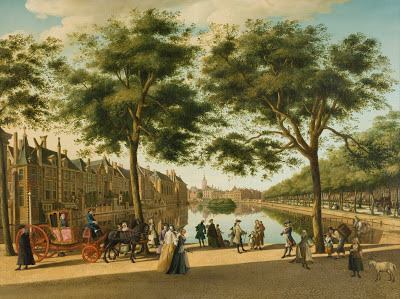 For a city of around 40.000 inhabitants, The Hague's musical life in the second half of the 18th century was therefore quite significant. The Hague also had a thriving music publishing industry with very effective international distribution. Publishing houses included Spangenberg and, most famously, the Hummel brothers who successfully expanded their business to Amsterdam and Berlin from their beginnings in The Hague in the 1750's. The opportunity to have their music published, particularly by the Hummel brothers, was an extra reason for composer/performers such as Ricci and Zappa, C.F. Abel, J.C. Bach, J.B.Wendling, F.X.Richter and C. Stamitz to visit the city. The Hague was a career advancing and financially nutritious stop on the international music touring circuit. The city's Comédie française offered its orchestral musicians a permanent position with a salary, often further boosted with supplementary payments for extra services. The court itself maintained a court orchestra of around 25 to 35 musicians, 10 to 13 of whom were in permanent service. The members of this core group each received a yearly salary, supplemented by extra payments for performances. The remaining musicians ('musiciens particuliers' or freelancers) were hired by the court, either per performance or per season, as solo, ensemble and/or orchestral players. These were either local or international musicians who were based in The Hague for a longer or shorter period of time – from a couple of weeks through to a couple of years or even decades, as was the case for Zappa and Ricci. The most important regular concert series in The Hague was the Sunday 'Court Concerts', given in the winter season. The tradition of these concerts commenced in the winter of 1761/1762. Distinguished citizens of the city, ambassadors, and other foreign dignitaries were invited to attend. At these events, members of the court as well as the citizens of The Hague were most excited by the appearances of famous foreign soloists; virtuosi and exotic musical figures brought an exciting edge and variety to the programming and performances. These special musical guests included the Mozart family, C. Stamitz, Beethoven, Dussek, J.N. Hummel, and of course Ricci and Zappa. And it is in the lists of musicians hired for the court's winter concert seasons between 1766 and 1768 that we see the names of the 'musiciens particuliers' Zappa and Ricci. The season itself ran from 1 October through to 1 May and was comprised of approximately 20 concerts. Interestingly, in the court's archive there is a detailed plan for those years to reduce the costs of the court's music programme by paying the musicians not per concert but by the whole season. Both Zappa and Ricci are recorded to have received fl. 210 for their services during each of these winter seasons11. During the summers of these years, Zappa and Ricci probably travelled as they had done earlier, possibly together, giving concerts and music lessons. In 1765 Zappa had compositions published by Welcker in London (and later in Paris and The Hague) as 'Music Master to the Duke of York' (whom he knew from the Duke's time in Milan). He may have visited England with Ricci in the summer of 1766, but in the autumn of that year they were certainly back in the Netherlands, also giving concerts in Utrecht on 25 November and in Amsterdam on 4 December12. In the spring of 1767 they made a concert tour to Antwerp, Ghent and Brussels, going on to London and then coming back from England via Brussels and Mechelen13. Zappa 'erweckte durch seinen sanften und schönen Ton die Bewunderung der Zuhörer' (with his mellow and beautiful tone Zappa aroused the admiration of his listeners) 18. Ricci returned permanently to Como in 1780, but it appears that Zappa kept The Hague as his home-base. He is certainly there from the mid-1780's onwards, as there is, in the city´s notarial archive, a confirmation of Zappa's presence in the city in 1785. Zappa requests The Hague notary A. van Wijck to investigate a situation with a bill of exchange ('lettre de change'), issued on 29 October 1785 in Genoa, which cannot be cashed. In the end, the notary is only able to register a complaint19. In the mid-1780's, Zappa was in his late 60's, his travels became less frequent, especially after 1788. By this time he is a musician with an international reputation, and in his adopted city of The Hague he had also become a highly appreciated and a well-established figure, having built up a successful combination of professional activities. He performed regularly at the court concerts, his compositions continued to be made available by the Hummel publishers, and he was also busy organising private concerts, such as one which took place on 24 April 1788 in the Oude Doelen (Tournooiveld, The Hague) featuring the singer Mme Longeau20. Anne Ponet, a.k.a. Mme Longeau, was the prima donna (or 'première chanteuse') of The Hague's Comédie française21. From 30 March 1788 onwards Zappa's name consistently appears at the top of the list of special musicians for the court concerts. He performed on 6, 13 and 20 April as well as in various concerts in May. For each concert he received 3 ducats (c. fl. 15,50). In June 1788 he accompanied the court to the palace Het Loo (Apeldoorn) where he performed in seven concerts. On 20 and 27 July 1788 Zappa played again for the court, this time back in The Hague – in de ´Orangen Sael´ (Orange Hall) of the Summer Palace, Huis ten Bosch. At this stage in his career, it seems that Zappa was being viewed by the court more and more as a permanent fixture, which, in practice, meant that he played more often but was paid less per performance. For example, for a concert on 13 August 1788 he received fl. 7, just like the other musicians. For 17 August however, his wage is fl. 15,15, also for 28 September and for each of the 7 last concerts of 1788 (9, 16, 23, 30 November and 14, 21 and 28 December). All the same, on the list of participating musicians, Zappa´s name remained at the top of the list, unless there was a foreign guest soloist present, in which case his/her name appeared at the top. Alongside his concert activities, Zappa was paid for composing and supplying music to the court. At the end of 1788 he received fl. 63 for delivering works for pianoforte and a symphony to Princess Louise and in 1789 fl. 42 for composing a symphony for William V, in honour of the stadholder's birthday, and for the delivery of two symphonies by Haydn. On 4 January 1789, Zappa was part of a court concert held in the Binnenhof and of the following row of concerts with performances on 18 and 25 January and 1, 8, 15 and 26 February. In this period, the stadholder was given urgent advice by his financial advisers to cut back on court expenditure. Interestingly, these advisers were not fully aware of the substantial payments made by the music-loving stadholder towards the cultural activities of the court from his own private account. Zappa continued to play as the first on the list of musicians in a performance on 26 April 1789, for which he again received a payment of fl. 15,15. On 13 and 20 September, 18 October and 1 November 1789, Zappa performed in Huis ten Bosch, and on 15 November in the Binnenhof. Despite the perceived financial limitations of the court at the time, a total of 40 concerts was given at the court in 1790. For the concert on 24 January 1790, Zappa received fl. 15,15, however for the subsequent concerts his fee was reduced to fl. 14. Zappa's name no longer appears at the top of the list of players, and he is not mentioned separately every time any more, although he is specifically mentioned in relation to the performance on 28 February 179022. At a concert at court on 7 March 1790, a compatriot of Zappa, the Italian opera singer Joseph Calcagni, appeared, receiving a fee of fl. 63 for his services, and appeared again on 16 May, this time receiving a payment of 6 ducats (c. fl. 35). Zappa is mentioned as participating in the 'Groote Tafel Musik' in Huis ten Bosch on 24 Augustus. Calcagni sang in the Binnenhof on 10 and on 17 October 1790. For this last occasion, Calcagni's fee is not determined – 'pour mémoire, à fixer plus tard' (to be established at a later date). For this performance there were 16 'musiciens particuliers' present, including 2 cellists, and, whilst Zappa is not specifically mentioned, he was probably one of the two. An interesting question is whether Calcagni's appearance at the court in The Hague was in some way organised or brokered by Zappa, and whether this may have somehow resulted in or contributed to an ensuing, unhappy and lengthy financial battle between Calcagni and Zappa. Calcagni received a further fl. 100 for his artistic contributions to the concert on 31 October 1790 and three other performances. The next year, there is a note dated 16 March 1791 by the court dignitary, Count Van Heiden, that Calcagni should be paid a further fl. 140 for a series of (probably private) performances at the court23. In the meantime, Calcagni had given a public concert at The Hague's Comédie française on 10 November 179024, after which he made immediate use of his increased fame in the city, placing an advertisement in The Hague newspaper on 13 November that one could take singing lessons with him25. The relationship between the two Italians, Zappa and Calcagni, was, at least in regards to financial matters, not good. On 15 November 1790, Calcagni had a public notary record his intention to proceed to sue The Hague resident, Francesco Zappa26. The subject of the disagreement is the collection of a debt apparently owed to Calcagni by Zappa. As confirmed by The Hague's law court on 2 February 1791, the amount owed by Zappa was 88 gold ducats or 462 guilders, with interest. In the record books, the case escalates and is worded in stronger and stronger terminology each time, appearing about 10 times in all in the notarial and judicial records. The result achieved from all of these deliberations, however, is unfortunately not clear27. Meanwhile, Zappa was waiting his turn to receive payment. He was expecting income from some French connections, and on 22 April 1790 he appointed a notary in The Hague to give power of attorney to two bankers in Paris to act on his behalf. It seems that Zappa had various stocks and shares from which he hoped to receive payments, including from a 'Compagnie des Indes'28. On this notarial act we find Zappa's own signature. If, during my stay here in The Hague, I should fall into a situation of decay or poverty, I do declare that I will leave The Hague and its area of jurisdiction so that I will never burden the city's social welfare system through asking for either assistance or dispensation29. The form was signed by Zappa on 28 July 1791. Subsequently, he received a permanent residence permit on 1 August and was entered in the city's registry of foreigners as 'Francesco Zappa, geboren in Vrankrijk (sic), musikant, wonend in de Papestraat' (Francesco Zappa, born in France, musician, residing in the Papestraat)30. During this turbulent time of revolution across Europe, Zappa kept performing at court, for example during the wedding celebrations of William V's son, Prince William (the hereditary stadholder, and future King William I) on 3, 4 and 5 November 1791. On this special occasion two orchestras performed. Zappa was part of the festivities and received, like the other musicians, fl. 31,10 for his services. Despite the increasingly threatening political situation, the court continued its music programme. On 4 May and on 3 November 1793 Zappa performed at the 'Groot Tafel Musik' in the Binnenhof and on 5 January 1794 in a concert in the same location. In February 1794, the court concertmaster J. Malherbe, together with L. Spangenberg and Zappa, gave a number of public concerts in the Oude Doelen (Tournooiveld, The Hague) and the Prince of Orange paid fl. 100 for 5 subscriptions to these 'woensdagse concerten' (Wednesday Concerts)31. Following this, there were more concerts, even despite the political situation and the Prince's decreasing finances. The last court concert was held on 2 November 1794 in the Binnenhof, and Zappa was there. On 18 January 1795 the French army reached The Hague and the stadholder's family left for England, a situation which put an end to the court's music programme and orchestra. Most of the permanent members of the hofkapel received a small pension; however, the 'musiciens particuliers', including Zappa, received nothing. Most of the younger musicians ended up leaving The Hague in search of work elsewhere. The court's concertmaster J. Malherbe moved to Amsterdam and gained employment as a freelancer and later at the Grand Théatre. The court's older generation of musicians such as the previous hofkapelmeester, C.E. Graaf, were already retired; others, like Zappa, also remained in The Hague, surviving as best they could. At the point at which the court ceased to exist, Zappa was in his late 70's. He passed away at his home in the centre of The Hague a few years later on 17 January 1803 at the age of 85. At the time he was sharing a house with his landlord, J.H. Reuser, on the Turfmarkt 32. A certain Zappa had died and was without any relatives and that the landlord requests that the city council facilitate the necessary services. After deliberation, the resolution is made to authorise the administrative official Berkhout to commit the body of the late Zappa to earth in the least costly manner, and to also take stock of the deceased's property33. Zappa was buried on 19 January 1803 in the Noorderkerkhof in The Hague, 85 years old, cause of death: 'verval van kragten' (old age)34. The total value of his estate amounted therefore to less than a third of what, on average, Zappa received for one court concert. This amount was not enough to pay for the normal burial fees and administrative costs. The city council spread the proceeds of Zappa's estate over these costs and covered the remaining amount itself. Despite Zappa's act of renunciation of 1791, it seems that the city council was prepared to exercise its responsibility for him as an elderly resident of The Hague. Only, after his death. In the period from his first concerts in the Netherlands in September 1764 through to his death in The Hague on 17 January 1803, Francesco Zappa made a substantial contribution to the musical life and cultural heritage of the Netherlands. We know that for a time he lived in the picturesque Papestraat in the centre of The Hague (around the corner from both the Binnenhof and the Oude Hof, now Paleis Noordeinde) and then later on the Turfmarkt. Because of the missing court records for the 1770's, it remains difficult to prove that Zappa definitely lived and worked in The Hague in that decade. However, given his good work situation with the court in the 1760's and again in the 1780's and his close friendship with Ricci (who was in The Hague for at least part of the 1770's) it seems highly likely that Zappa was in The Hague for at least part of that period. In any case, it is possible to prove that he was in The Hague for much of the 1760's, most of the 1780's and all of the 1790's, as detailed in this article. At least for a little while after his death, Zappa's music remained popular, in print and in the publishers' catalogues and advertisements. In the Rotterdam newspaper of 26 May 1803 the widow of music publisher B. Hummel, located in the Spuistraat in Den Haag, advertised specifically that she had works by F. Zappa available for sale, mentioning the pieces by name36. As the Dutch would have it 'wie schrijft blijft' (he who writes will be remembered) and it seems also those who are written to are remembered – in this case Ricci. Apart from the one letter from Zappa to Ricci preserved in the Ricci correspondence in Como, there is, as far as is currently known, no further extant Zappa correspondence. Concerning his years in The Hague, the chances of finding more biographical information, seem fairly small. However, Francesco Zappa's highly attractive, energising music lives on and his compositions are currently experiencing a wave of new interest37. Simon Murphy, Corry Klugkist, The Hague, November 2011. Revision for NDA web publication January 2013. An earlier, shorter version of this article was first published in the British early music quarterly, Musica Antiqua, vol 1 issue 3, July - September 2012 ( www.MusicaAntiqua.co.uk ). © Simon Murphy and Cornelia Klugkist, 2011. 1	The New Grove Dictionary, 27 (2001) 747/8. G. Salvetti, V. Walden on Zappa. Die Musik in Geschichte und Gegenwart, 17 (2007) 1342. K.H. Köhler on Zappa. 2	S. Murphy (conductor), New Dutch Academy, SA-CD recording: Zappa Symphonies, Crowning Glory, The Musical Heritage of the Netherlands. Pentatone PTC 5186 365 (2009). 3	F. Zappa, Symphonies, edited by S. Murphy. New Dutch Academy (The Hague, 2007). Several available for hire through Albersen Verhuur. 5	S. Murphy, op.cit. Zappa Symphonies (2009). 6	See footnote 34 regarding birth and death dates. In terms of the question of his birth city, Zappa describes himself as being 'from Milan' on a number of official documents. 7	G. Salvetti, NGD, 27, 747/8. 8	H. Metzelaar, op.cit. 121: reconstruction of Ricci´s (and Zappa´s) travels. 9	R. Rasch, 'The Italian Presence in the Musical Life of the Dutch Republic', in The eighteenth-century diaspora of Italian music and musicians, ed. R. Strohm (Turnhout, 2001) 177-210 (194). 10	A. Lieffering, E. Ebbers, Database ´Eighteenth-Century Music and theatre advertisements from the ´s-Gravenhaagsche Courant and Gazette de La Haye..´ (1999). Data Archiving and Networked Services (2010) (www.dans.knaw.nl). This concerned a ´Groot Vocael en Instrumentael Concert´ met stukken ´van eyge compositie en van een nieuwe smaek´ en ´Mademoiselle Maggiore zal haar stem laeten hooren´. Billetten bij Sr. Benoît, Oude Doelen, 3 gulden. 11	M. De Smet, op.cit. 41. 12	R. Rasch, op.cit. 194. 13	H. Metzelaar, op.cit 121, reconstruction. 14	H. Metzelaar, op.cit. 96; full Italian text in O. Tajetti, `Francesco Zappa, Violoncellista e Compositore Milanese´ in Antiquae musicae italicae studiosi, 6 (1987) 9-12. Original letter in Ricci Correspondence in Archivio di Stato in Como. 15	H. Metzelaar, op.cit. 122. 17	NGD, 27, 748, without citation of the source. 18	H. Mendel & A. Reissmann, Musikalisches Conversationslexicon (Berlin 1879) 432. 19	Gemeente Archief Den Haag: Notarieel Archief (City Archive of The Hague: Notarial Archive). 20	A. Lieffering, Database: ´sGC dd 23 april 1788: ´De heer François Zappa, Virtuoso van Milanen zal morgen den 24 April in den Oude Doelen een groot Vocaal en Instrumentaal Concert geven. Mejufvr. Longeau zal in het zelve zingen en gemelde Heer Zappa zal verscheiden stukken van zyne Compositie op de Violoncelle executeren, onder anderen een Concert van een nieuwe soort waarin elk instrument deszelfs hoofdpartij zal executeren; waar na hy een solo zal geven met Variatien …´ Billetten bij J. Konig, Oude Doelen voor 2 gulden. 21	Upon Mme Longeau's death on 13 September 1793, the notary Van Wijck made an inventory of her estate and debts in which it appears that 'Le maitre de musique Zappa' was owed 12 guilders by her - A.J. Koogje, Le Théâtre français de La Haye, 1789-1795. (Thesis Utrecht University 1987) 297, 310. 22	M. De Smet, op.cit. passim. 23	M. De Smet, op.cit. 130: ´pour les concerts auxquels il fut assisté (par les souverains)´. 24	A. Lieffering, Database: ´s-Gravenhaagse Courant, 8 november 1790. ´le Sr. Calcagni Soprano Chanteur Italien, aura l´honneur de donner Mercredi 10 Novembre 1790 à la Salle du Spectacle Français, un Grand Concert Vocal & Instrumental, Mr. Westerhoff, se fera entendre sur le Contrebasse & l´Alto Viola, Musique de sa Composition, & Mr. Calcagni, chantera des Airs Italien´. 26	Gemeente Archief Den Haag: Notarieel Archief, Procuratie ad Negotia. 27	Gemeente Archief Den Haag: Notarieel Archief, Rechtelijk (Judicial) Archief. 28	Gemeente Archief Den Haag: Notarieel Archief, Procuratie ad Negotia. 29	´… ingevalle ik gedurende mijn verblijf alhier in den Hage, onverhoopt tot eenig verval van zaken of armoede kwame te geraken ik als dan uit ´s Gravenhage en de Jurisdictie van dien zal vertrekken; zo dat ik mij by dezen verbinde de Armen van ´s Gravenhage nooit om eenige adsistentie of bedeeling te zullen lastig vallen.´ Gemeente Archief Den Haag: Rechtelijk Archief. 30	Gemeente Archief Den Haag: Rechtelijk Archief. 31	M. De Smet, op.cit. 153. 32 later numbered 22 and now a café on the ground floor of The Hague's modern Town Hall which, rather appropriately, overlooks the city's symphony hall. Gemeente Archief Den Haag: Rechtelijk Archief. 34	Gemeente Archief Den Haag: Overlijdens- en begraaf-registers (Death and Burial Records). 35	´Het provenue van den insolvente Boedel en nalaatenschap van wijlen F. Zappa, gewoond hebbende alhier in den Haage, ingevolge Reekening en verantwoording door Johannes Wiegman Berkhout … ten overstaan van … commissarissen op den 12 Juli 1803 gedaan slegts bedraagende eene somme van Vier guldens en vier penningen …´ Gemeente Archief Den Haag: Rechtelijk Archief. 37	For a list of some 80 extant manuscripts of Zappa's music see www.rism.info. How many of these may be autograph manuscripts is not yet known.